Although the day started cool, it soon warmed up, and people flocked to the park. As we hiked the Chinquapin Trail around the park, we probably encountered no fewer than 75 people, including 3 groups of at least 10 people each. Despite the traffic on the trails, we did enjoy this hike. The trails are well-marked and maintained, and we encountered no problems. Numerous roots on the trail are probably the worst thing about this trail, and they are not bad at all. This is a typical hike through the woods. The only unique features would be the numerous boardwalks (2 in the northern part of the hike, and another across Big Chinquapin Creek) and the lake, including the dam and spillway. If anyone else hikes this trail, I would like to get their impression of the area just north of where the Chinquapin Trail intersects the Triple C Cutoff just north of the dam. There seemed to be a depression there where the trail dipped down for perhaps 100 yards or more. The trees and underbrush were more dense there, it seemed; very little sunlight filtered down there. For others who might be considering this trail, pack a lunch and plan to eat at the spillway. On the south side of the spillway is a picnic table with a good view of the lake; it's a good spot for lunch. We hiked the trail counter-clockwise. Recent rains had caused some run off, so little streams appeared where they normally don't. That made the hike fun, though, because it took on a different appearance than it has, say, on a sunny summer day. We enjoyed watching a group from a local school climb up Buzzard's Roost. Recent flooding left debris in brush at eye level along Sandy Creek. Dogwoods were blooming almost everywhere on the day of our hike. We began from our trailer in Knight's Bluff Campground and followed the entire trail, including the nature loop, to the boat ramp in the eastern part of the park. They had recently conducted a prescribed burn in most of the area from the nature trail to the boat ramp, but green was beginning to come out. This new park is a joint venture of TPW and the city of Mineola. They have done a nice job. The trailhead facilities include great views along "wildlife viewing corridors" and well-maintained restroom facilities. The first quarter mile of the trail is paved (no bicyles or motorized vehicles allowed). 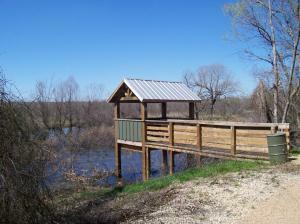 The majority of the trail is an old railroad bed through a wetland north of the Sabine River. It is an easy hike, and it is very close to Mineola, so there were lots of people about when we were there. It really is a walk, not a hike.